This is the new MAN TGA recovery vehicle made by Conrad. 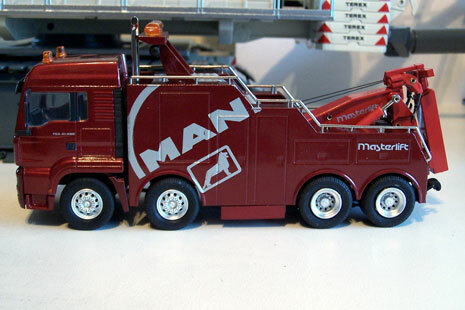 This model is available in the shown demo livery of MAN or in yellow. The model is nicely finished, with chrome handrails and rims. 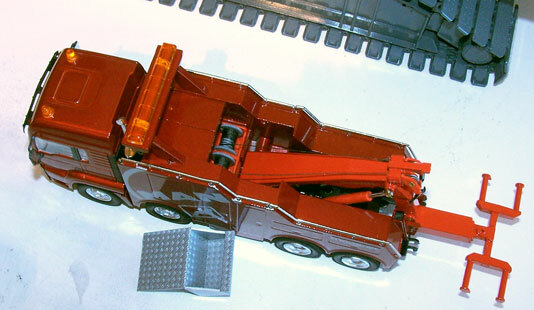 The "forks" that carry the towed truck can be stored in the box between the front and rear axles. The two working winches are hidden under a plastic cover. In my opinion this plastic panel should have been chrome plated to give it a more realistic look. Overall this is a very nice model. It probably doesn't really fit in a collection of cranes and construction equipment, but it sure looks good on the shelve.